Shimmering in pools on industrial hogs farms in North Carolina, several million tons of urine and feces await the arrival of Hurricane Florence. The state is home to about as many pigs as it is people. Its hog farms are a major part of the state economy, with many of them concentrated in the eastern part of North Carolina, where Hurricane Florence is expected to drop 20 to 30 inches this week. The water will pour down on the hog farms’ denitrifying lagoons: big pools that hold pig urine, poop, blood, and other bodily excrements. Experts worry that if the lagoons flood, their contents could spread to nearby areas and contaminate local water supplies. Pig waste carries bacteria like E. coli and Salmonella, says Lance Price, George Washington University public health professor and founder of the Antibiotic Resistance Action Center. 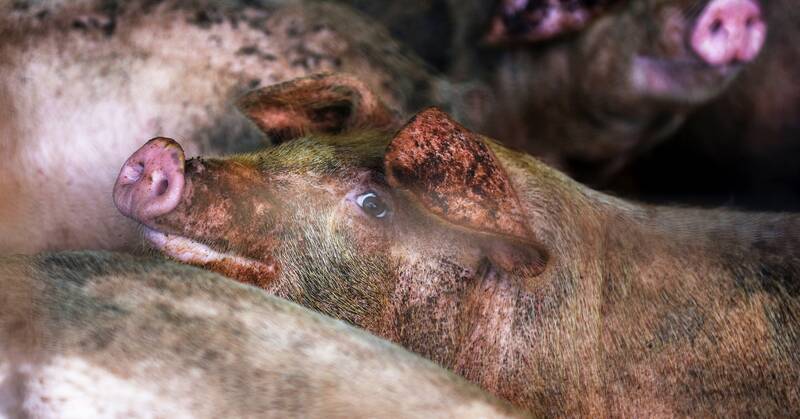 Scientists also consider North Carolina hog farms a hot zone of antibiotic-resistant bacteria. Hospitals near industrial pig farms in eastern North Carolina have found distinct strains of MRSA among livestock farmers. “Scary bugs are going to be in the waste and in the poo,” says Price. To prepare for the storm, farmers are stockpiling feed, moving their animals to higher ground, and checking their generators. They’ve also been spraying waste onto fields as fertilizer all summer, to help prevent the lagoons from overflowing. But with all the incoming rain, researchers and activists worry that the waste from the fields will wash down rivers and streams, just as it would if the lagoons are breached. Even under normal conditions, pollutants on the farms cause health problems in nearby settlements, triggering respiratory problems and reduced lung function. “These farms affect wellbeing, health, and water quality in the area,” says Jill Johnston, formerly an epidemiologist at the University of North Carolina and now an environmental health professor at the University of Southern California. Her research team found that the pollutants from pig farms disproportionately harm African American, Latino, and Native American communities. During the last major hurricane in the area, Hurricane Matthew in 2016, power went out, trees fell down, and 26 people died in North Carolina. Out of 3,750 lagoons in the state, 14 of them flooded. As the the North Carolina Pork Council points out, municipal waste facilities also spewed sewage during that storm. But pigs produce ten times the amount of poop that humans do. And Hurricane Florence threatens to drop twice the amount of rain as Matthew. “I’m really, really scared that the consequences will be worse than everything we’ve ever seen,” says Rick Dove, senior advisor to the Waterkeeper Alliance, an activist group that advocates for drinkable, fishable water. The National Hurricane Center is warning of a storm surge—a flood of water that will rise from the coast—as well as tropical-storm-force winds and flooding further inland. The already higher-than-usual sea levels are intensifying the problem. “We have never, in the history of North Carolina, had a storm like the one that’s coming in right now,” says Dove. Hog farming has become an increasingly condensed operation over the last few decades, especially on the east coast, which intensifies their effects in both day-to-day life and hurricane season. “You can’t tell me that you can put that many hogs and chickens on soil that is largely beach sand and it will not have significant environmental impacts,” says Scott Marlow, senior policy specialist at Rural Advancement Foundation International, a nonprofit group that supports farmers. Previous PostPrevious Consob, Nava: "Richiesta dimissioni questione solo politica"